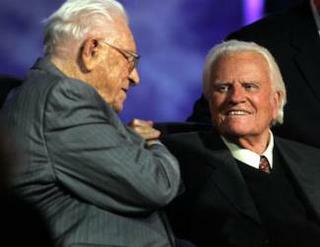 Billy Graham hadn't had a crusade in New York City since 1957. Now it seems strange that his career of evangelizing the world ended there July 2005 at Flushing Meadows Park. As Billy steps down his son, Franklin will keep the NWO agenda going. By the end of the three-day Crusade nearly 9,000 people had confessed Christ as Savior and Lord. If this is his last crusade in the U.S., this is a relief from the dark side of this man. The BGEA has been a front for the Roman Catholic church and the Rothschilds Dynasty. Graham has hobnobbed with the elite of the high es-halon from the US Presidents and 33-degree freemason Dwight D. Eisenhower, the Pope and Hollywood celebrities who are Satanists. Graham was their MK-Ultra poster boy to continue in their agenda to deceive the masses and the church to follow the Antichrist. UPDATE: January 2018, Billy Graham died at the age of 99. Many prophecies surrounded his death that it would be the end of the world.